Technician Renee Bigner (top) feeds poultry manure into the hopper of a pellet mill while chemist Kari Fitzmorris (front) collects finished pellets. 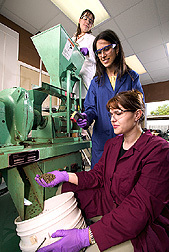 Chemist Isabel Lima monitors the mill’s operation by measuring pellet temperature with an infrared probe. Humans and charcoal have a long association. The familiar briquettes heating our backyard grills can trace their origins to charcoal that was formed by humans thousands of years ago for fuel. Char is created when an organic material—usually wood—is burned in a smothered environment. Now, several millennia later, char is proving its utility again. But this time it comes from an unexpected source—turkey and chicken droppings. Perhaps even stranger, ARS researchers have found that ordinary poultry manure, when converted by carbonization into granules and powders, can mop up pollutants in water. Key to the litter’s newfound value is the charring process. When heated in an atmosphere stripped of oxygen, the waste—which can also include feathers and bedding material—takes on new qualities, such as a large surface area and high porosity. But most surprising is the charred material’s chemical magnetism, ideal for attracting hard-to-snag metals—like copper, cadmium, and zinc—in tainted waters. The scientists behind this unusual research are chemists Isabel M. Lima and Wayne E. Marshall in the Commodity Utilization Research Unit of the agency’s Southern Regional Research Center (SRRC) in New Orleans, Louisiana. According to Lima, poultry char is perfectly suited for use in wastewater treatment systems, for scavenging metals discharged by industrial activities, and for adsorbing excess fertilizer nutrients from farming operations. Poultry waste also has a traditional value. It’s sold for $3 to $10 per ton as fertilizer. But when amended soils become too saturated with manure, nitrogen and phosphorus in the waste can leach into nearby rivers, streams, and groundwater supplies. Excess phosphorus in marine environments can stoke extensive algal blooms. These growth explosions and their subsequent breakdown steal valuable oxygen away from fish and other aquatic organisms, causing them to die off. 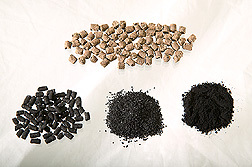 Poultry manure pellets (top) are converted to activated carbon pellets (left) and can then be ground into either granular (center) or powdered (right) form, depending on end use and filtering task. For several years, Marshall and SRRC colleagues have investigated various low-value agricultural waste materials—from soybean hulls to macadamia nut shells—to serve as activated carbons for environmental remediation. But Marshall and Lima ventured into new territory by exploring animal byproducts, like poultry litter, to create carbons and chars. The researchers had also been contacted by Resource Conservation and Development Councils from counties across Mississippi who were concerned about overabundant and burdensome chicken litter in their state. Together, Mississippi, Alabama, and Georgia produce more than one-third of the broiler chickens in the United States. “That’s when we began our work with activated carbons made from poultry litter, hoping to at least reduce poultry waste mass and perhaps find a valuable use for it,” Marshall explains. Up to now, coal and coconut shells have been the leading precursor materials in the activated-carbon market. But coal is a nonrenewable resource, costing between $60 and $80 per ton. And coconut shells typically come from overseas, where the palm tree crop is vulnerable to monsoons and tropical storm damage. 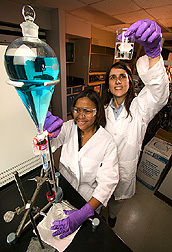 In a test of carbon’s ability to adsorb metals from water, student technician Bonnie Dillon (left) and chemist Isabel Lima run a copper ion solution (blue liquid) through a column of broiler manure-based carbon. When the copper is removed, the solution becomes clear. About 3 years ago, Lima and Marshall first transformed poultry litter into activated carbons by a two-step process involving charring and activation. During the activation process, they used steam to bombard the charred litter material to induce porosity. Because the initial results far exceeded their expectations, Lima and Marshall wondered whether a simpler and less costly char process that skips activation could still transform poultry litter into an effective carbon material for filtering. During the one-step charring process, the poultry litter is heated to at least 700˚C, or about 1,300˚F. At this point, some of the inorganic molecules originally found in the litter can become permanently fixed to the carbon’s lattice-like structure. In poultry char, these molecules lend the material a negative charge, making it an ideal magnet for attracting positively charged ions from metals like copper, zinc, and cadmium. The researchers want to see whether the char can seize other positively charged molecules, like lead and mercury, which are considered priority pollutants. The researchers believe that phosphorus is the component in litter responsible for the metal-grabbing activity. Phosphorus shows up in litter because it’s fed to chickens and turkeys as a dietary supplement. Lima has created powders, granules, and pellets of the char to suit different filtering tasks. “Waste treatment plants might use a variety of methods, depending on the application, to treat waste waters,” says Lima. For example, powders made from the char could be added to large volumes of metal-laden waters to cling to dissolved metallic ions. Columns containing larger pellets might be used where water flow and drainage issues are important. According to the scientists, because of their exceptional ability to adsorb hard-to-get metals, char and carbons made from poultry litter could potentially net poultry farmers $1 to $2 per pound—or up to $4,000 per ton of manure! In regions like the Delmarva Peninsula of Delaware, Maryland, and Virginia, where poultry manure production can reach 1 million tons per year, there’s enough manure to support several carbon-manufacturing facilities and a ready market for waste-treating carbons in the Washington, D.C., Baltimore, and Philadelphia metropolitan areas. Lima and Marshall have filed a patent application and are hoping to attract something themselves: interested private-sector partners to further develop this up-and-coming research.—By Erin K. Peabody, Agricultural Research Service Information Staff. Isabel M. Lima and Wayne E. Marshall are with the USDA-ARS Southern Regional Research Center, 1100 Robert E. Lee Blvd., New Orleans, LA 70124-4305; phone (504) 286-4515 [Lima], (504) 286-4356 [Marshall], fax (504) 286-4367.